LPG gas cylinders are heavy and pose a manual handling risk to employees. 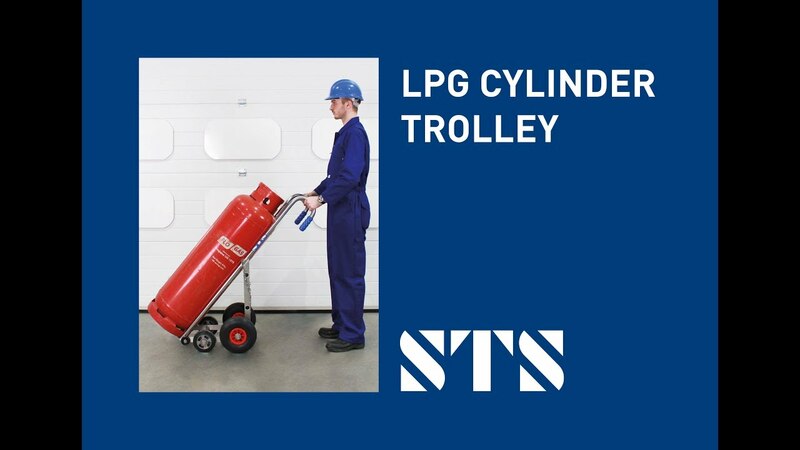 We developed the CTS03 gas cylinder trolley to make transporting LPG bottles safer, the gas bottle trolley is optimised for moving cylinders both inside and out. As with all STS products the design is cutting-edge; unique geometry assists in distributing cylinder weight and therefore reduces the load an operator experiences. Distinctive small wheels at the front of the unit allow you to manoeuvre the gas cylinder trolley when upright; you can wheel the baseplate under the LPG cylinder before leaning the trolley back into position. The four main wheels offer great manoeuvrability both inside on smooth floors, and outside on rough terrain. The trolley can tackle small steps with ease without compromising the stability of the load and safety of the operator. To ensure the propane cylinder is secure and fastened into place, we’ve fitted the gas bottle trolley with a stainless steel safety chain. While the trolley itself supports the cylinder and provides stability, the chain brings a second level of safety to the unit. Simply load the trolley as shown in the video, and place the chain around the tank before transporting it to the required location. See the full technical specification for our 47kg LPG Gas Cylinder Trolley for details such as weight, dimensions and load capacity. View the instruction manual for our 47kg LPG Gas Cylinder Trolley, which details how to safely operate and maintain the unit.